“Today, lovers of the outdoors learned that the country’s largest consumer co-op and specialty outdoor retailer, REI (Recreational Equipment, Inc.), will open its fifth flagship store in late 2016 at the site chosen by President Eisenhower for his inaugural ball and by the Beatles for their first concert in the U.S. 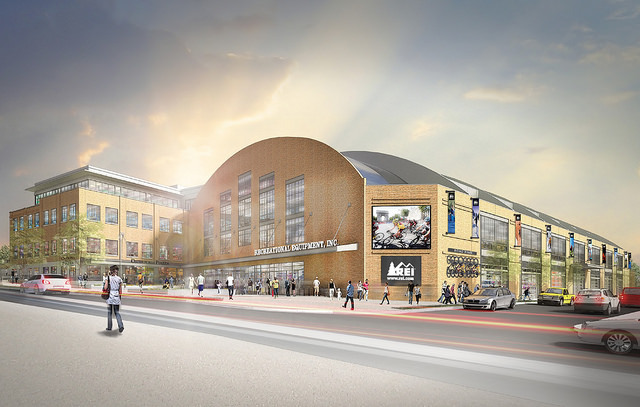 The REI flagship will serve the fast growing outdoor community in the region, including more than 281,000 REI members who live in and around Washington, D.C. already. The new REI will be a place to inspire, educate and outfit people who want to live more of their lives outside no matter their skill level or outdoor interest. It is being designed collaboratively. Representatives from the outdoor community are spending time together Wednesday evening to preview and discuss emerging plans including the store design, educational outdoor classes and partnerships with local non-profits, which are the foundation of all REI stores because they help REI members gain access to great places to play. REI will enhance its retail experience by introducing new design concepts in how products, services and educational programs are presented. The store will bring 150 new jobs to the local community. The new flagship will be more than 51,000 square feet and offer the top and emerging brands for camping, climbing, cycling, fitness, hiking, paddling, snow sports and travel. Bike, ski, and snowboard shops will provide expert assembly and repairs, while a rental department will serve those who need equipment for a weekend adventure or who wish to try before they buy. 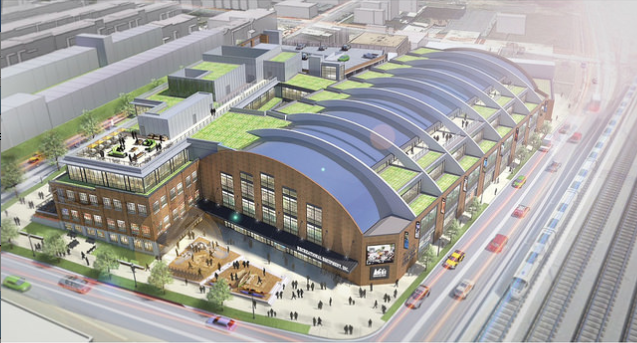 Steps away from Union Station in the NoMa neighborhood and easy access from the Metro’s red line or by bike, REI’s flagship will occupy the first floor of the Uline Arena. The building is undergoing a significant renovation led by Douglas Development. As the retailer’s fifth flagship in the country, it will join others in Seattle, Denver, Bloomington (Minn.) and the SoHo area of New York City. Like the Uline Arena, both the REI Denver and REI SoHo stores are in historic buildings. REI has served the outdoor community in the D.C./Baltimore area since 1987. Once open, the flagship will join eight other stores in the region that serve more than 281,000 REI members – the highest concentration on the east coast. Anyone may shop with REI, but members pay a one-time $20 fee and receive a share in the company’s profits through an annual member refund. Members also enjoy special promotions and discounts on REI Adventures trips and REI Outdoor School classes. Anyone who loves the outdoors can come to the co-op to learn with the local REI Outdoor School. Last year, REI educated 11,219 participants in the region and nearly 200,000 people across the country. The flagship will build on the region’s already robust schedule of free and low-cost in-store classes, field programs and day outings for cycling, paddling, fitness, hiking and camping, climbing, snow sports, photography and wilderness medicine. Examples of programs at popular local destinations are DC Monuments Sunset Kayak Tour, Overnight Backpacking in Shenandoah National Park and Introduction to Outdoor Rock Climbing at Carderock. Wherever REI has a presence, the co-op partners with nonprofit organizations that care for places where its members play. Across the Washington, D.C. region, the company is proud to have strong relationships with local and nationally-based nonprofits. Last year, REI granted $4.6 million to over 300 local and national nonprofits across the country to improve more than 600 outdoor places. The Uline Arena flagship will highlight the important work of local and national nonprofits that increase outdoor access and inspire others to lead healthy active lifestyles. Uline Arena, also known as Washington Coliseum and The Arena, has a rich history. Opening in 1931 as the M.J. Ice Company, its success allowed Miguel Uline to construct an adjacent 8,000 seat arena. President Eisenhower hosted his first inaugural ball at the site in 1953, and professional hockey and basketball teams entertained sports fans. The building is perhaps most famous as the site of the Beatles’ first United States concert after their Ed Sullivan Show appearance in 1964. With architecturally significant features that include a concrete barrel vault roof and structural concrete arches, the Uline Arena joined the National Register of Historic Places in 2007. In partnership with Douglas Development, REI will weave in salvaged objects into its store design.